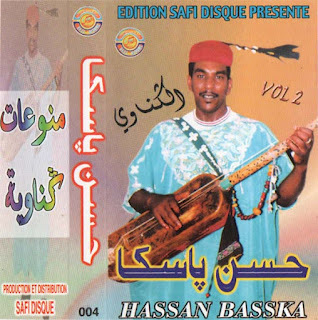 Here's a solid cassette from Hassan Baska and group. I wrote a bit about Hassan and his brothers in my post on Muluk el Hwa last week. This tape is from around Y2K. Tracks 1, 3 and 4 are straight-up, fiery Marrakchi tagnawit (that is, music from the Gnawa ritual repertoire). Quite nicely recorded, and high in energy. (Marred slightly by vocals going sharp on the first piece of track 3). The lead vocalist sounds to me like it could be Ahmed Baska rather than Hassan, but I'm not sure. Track 2 is an unusual gem, featuring 2 songs I believe to be originals. (They're certainly not from the tagnawit repertoire.) "Mamayo" features a darbuka in addition to guinbri and qraqeb. It is sung in a blues pentatonic (rather than the typical Gnawi pentatonic) and in a typical Maghrebi 2/4. In the second piece "Sudani Mani Zara", guinbri and qraqeb lock into a blues-swing groove! (totally weird - totally works!) 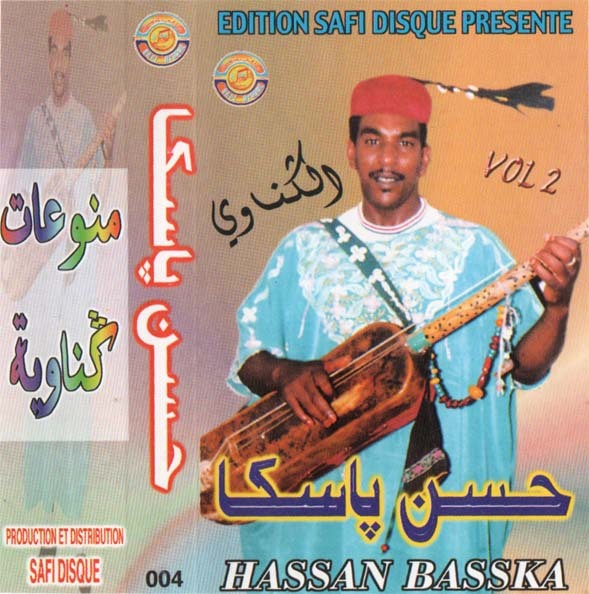 There are so many overblown Gnawa fusions - this one is about as simple as it gets, and is all the more sweet for it! The vocalist is different on this track than on the rest of the album. 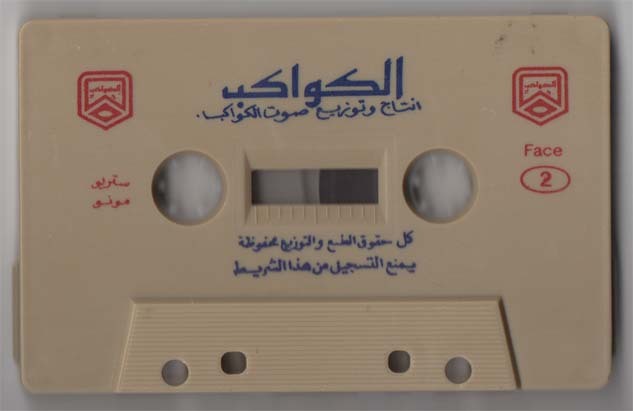 I think it may be Hassan singing here and Ahmed on the other tracks, but again, I could be wrong. 3 hours of Marrakchi Gnawa Lila audio!